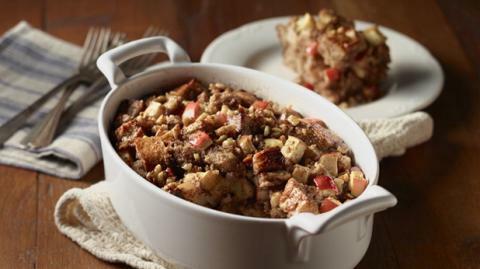 Apples, cinnamon, and whole grain bread make for a delicious dessert that is healthy too! Spray 9×9-inch baking dish with cooking spray. In a large bowl, whisk together egg, egg white, milk, brown sugar, vanilla, cinnamon, and ground cloves/allspice. Cut bread into 1/2-inch cubes. Add bread and apple cubes. Add dried fruit and nuts if desired. Mix well.